Various institutions in Israel deal with places of persecution and ghettoization during the Shoah in Europe. They commemorate the victims but also educate future generations. One of them is Beit Terezin at which Hani Pultorak works as an educator. She is also one of our Israeli partners of the project ‘Living Diversity in Germany and Israel’ and contributed this short article on the history and aims of Beit Terezin. Beit Theresienstadt was established on 1975 by survivors of Theresienstadt ghetto (Terezin in Czech) to commemorate the ghetto victims and to relate their story to the following generations. 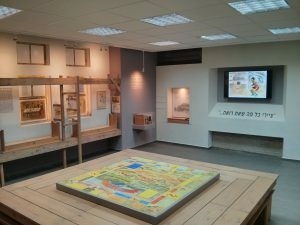 The education center at Beit Theresienstadt conducts a wide range of educational programs and seminars geared to elementary school, middle school, and high school students. In addition, Beit Theresienstadt holds seminars for IDF soldiers, university students, teachers and educators. The unusual story of the Theresienstadt ghetto facilitates a discussion on a wide variety of historic and humanistic topics, including: the Central European Jewry and its fate, the process of Ghettoization and the “Final Solution”, Jewish resistance, sport and the human spirit, education under impossible conditions, art and creativity in the ghetto as means of survival, the world of children and youth in the ghetto, and more. Dealing with the history of Theresienstadt ghetto enables students to learn and understand different aspects of values such as solidarity, spiritual resistance, friendship, human-spirit etc. Our programs prove the relevance of those values to the everyday life of young people in Israel today. For example, when dealing with the story of the soccer league that took place in the ghetto for two years (1943–1944), students will also hold discussions about racism and violence, hatred and limitations of free speech, the individual in contrast to the one of the crowd, the human spirit, and confronting difficulties. Another main topic concerns the children and youth in the ghetto: Most of the kids aged 12–16 lived in separate residence apart from their parents. This reality of breaking up the family cell dictated a change in the way of life and expressions of independence and maturation, forced the children to learn how to get along with other children from different backgrounds and try to have as normal life as possible. Most of our educational work is being held in the Beit Theresienstadt Museum while using the three room exhibitions. We use different pedagogical methods such as: lectures, presentations, films, personal/group work, explore and research, art/music creativity and live testimonies. Another part of our work includes activities for students/teachers at schools, projects for soldiers at IDF bases and special activity at football stadiums. The large variety of the subjects enables the educational center team to prepare suitable programs according to the specific group needs, and allows sharing the history and legacy of the Theresienstadt ghetto to a broader audience.